Learn how to decorate with fondant using this easy DIY set. 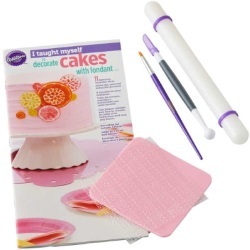 The I Taught Myself Fondant Cake Decorating Book Set features inspiring projects featuring step-by-step instructions with pictures. It also comes with all the tools you need to get straight to the fun of decorating. Plus, you’ll get 24/7 access to the I Taught Myself video library for project tutorials and the inside scoop from our expert’s tips. Whether you’re a first-timer or you’ve tried this before, I Taught Myself makes learning easier and decorating more fun. Complete all 6 unique decorating projects inspired by the latest fondant cake trends featured in the book. Set includes: Rolling Pin with Guide Rings, Ball/Cutting Tool, Decorating Brush, Thin Foam Square and I Taught Myself book.